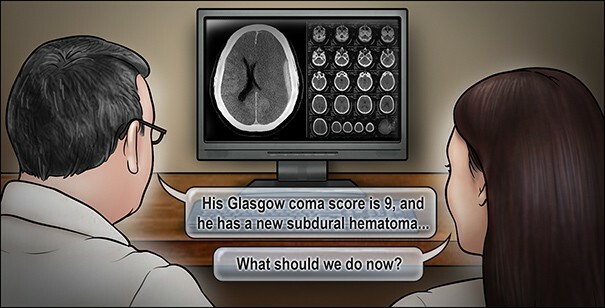 Case 10 of the NEJM’s critical care challenge asked for your opinion on the management of a traumatic subdural haematoma. The poll has now closed and a summary of the current best practice and the limited evidence in this field has been provided. A 77-year-old man whose medical history includes treated hypertension and hypercholesterolemia, previous heavy alcohol intake, and mild cognitive impairment has been discharged from the ICU following a complicated admission (15 days) with faecal peritonitis. On the third morning after discharge from the ICU, he is found on the floor of his room, having apparently fallen from his bed. CT reveals an acute subdural hematoma in the left hemisphere with underlying haemorrhagic contusion and 5-mm displacement of the midline intracranial structures. What is the most appropriate management of this patient’s traumatic brain injury? The majority of respondents (94%) voted to evacuate the subdural haematoma with 67% electing to also place an EVD and admit to the ICU for active management of increased intracranial pressure. Around a quarter (26%) said they would evacuate the subdural haematoma without placement of an ICP monitor. The series editors agree with this approach, noting that although his advanced age is an independent risk factor for poor outcome in TBI, active treatment remains appropriate. More information on prognosis in TBI (and an excellent prognosis calculator) can be found here. Although Chesnut et al (2012) failed to demonstrate that treatment guided by ICP monitoring significantly improved mortality or functional and cognitive status when compared to a protocol based on examination and CT, guidelines such as those of the Brain Trauma Foundation still recommend ICP monitoring in all patients with severe traumatic brain injury with potential for recovery. Oli provides an excellent overview of the Chesnut study and the role of ICP monitoring (as well as other key aspects of TBI management) here. Having returned from theatre with an ICP monitor in situ, the patient will require ongoing management to maintain an ICP <20. Figure 3 in the associated review article outlines a stepwise approach to the treatment of increased ICP with a summary of the (quite limited) levels of evidence supporting each intervention. For more on this, Matthew MacPartlin discusses the tiers of therapy for raised ICP pressure here while Anthony Delaney discusses decompressive craniectomy and therapeutic hypothermia (pre TTM trial) here.